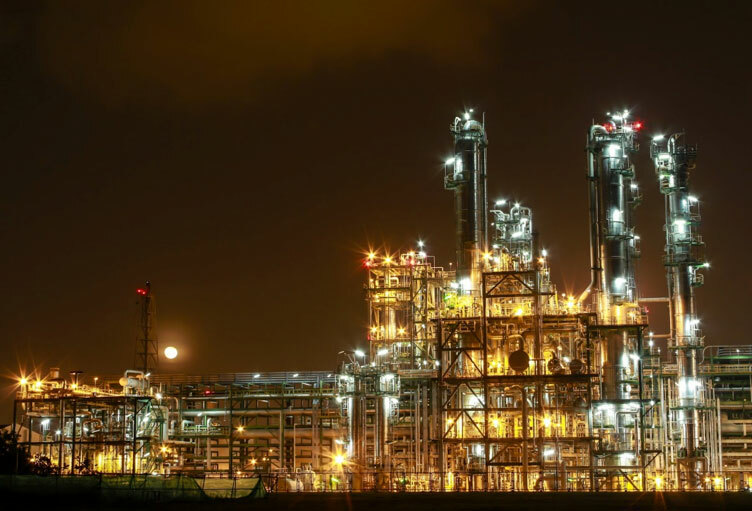 The generation of low-grade waste heat in the chemical industry is in abundance. Through this waste heat, one can generate hot water at 50 0C – 100 0C. However, most of the heat goes unused. The development of new technologies now has bought effective change in the utilization of this waste heat. It can be used for air conditioning and process cooling in an eco-friendly manner to optimize energy efficiency. How Can Waste Heat Be Utilized? There are numerous ways to utilize waste heat emerging from manufacturing plants, depending on the needs of the industry. Organizations use thermal driven chillers, absorption chillers or adsorption chillers based on their preferences. However, adsorption chillers are the most widely used equipment for utilizing waste heat. The chillers have been a part of the manufacturing industries for a long time. With the evolution of technology, the adsorption chillers manufacturers have also developed eco-friendly chillers. The advanced tech in these chillers uses inert adsorbent (Silica) and refrigerant (Water) to produce chilled water for air conditioning and process cooling. In the past, manufacturers used thermally driven chillers to utilize waste heat; however, such chillers required high upkeep and maintenance. Then there are the absorption chillers that depend on the corrosive solution of lithium bromide salt that corrodes the steel shell and copper tubing of the unit. Moreover, as the absorption chillers produce hydrogen, they require costly palladium cells in their unit to remove hydrogen. The lithium bromide solution in absorption chillers tends to solidify within the system while it is under operation. This change in state causes major problems in the working efficiency of the machine. Thus, the chillers require a dedicated caretaker to keep its working smooth. On the other hand, adsorption chillers utilize silica as their desiccant and municipal water as their refrigerant. There are no chemicals like lithium bromide, ammonia, CFC’s of Freons used in these chillers. By refraining from the use of these chemicals, the risks of hazardous material leaks and aggressive corrosion is reduced. Moreover, as adsorption chillers also use eco-friendly technology, they do not harm the atmosphere. Adsorption chillers also reduce upkeep and maintenance significantly as they use silica gel instead of the lithium bromide solution. 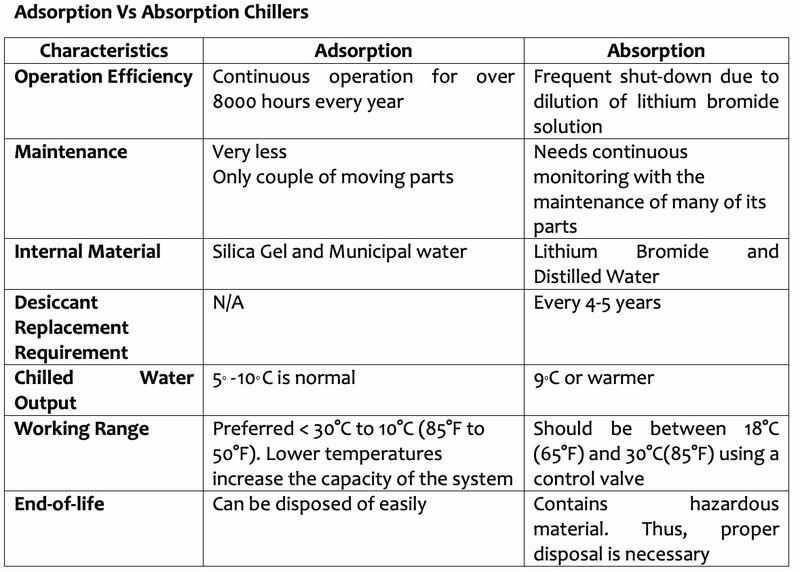 The number of moving parts in adsorption chillers is also comparatively low; therefore, they do not require regular attention that is necessary in case of absorption chillers. To decrease revenue losses and atmospheric pollution, manufacturing industry executives need a perfect solution to utilize the low-grade heat that remains unused. With the embedment of new technologies, adsorption chiller manufacturers can provide you with a product whose total cost of ownership in almost one-third that of absorption chillers. Therefore, if you are looking for a cost-effective, and eco-friendly solution to utilize the waste heat, adsorption chillers are the perfect solution for you.